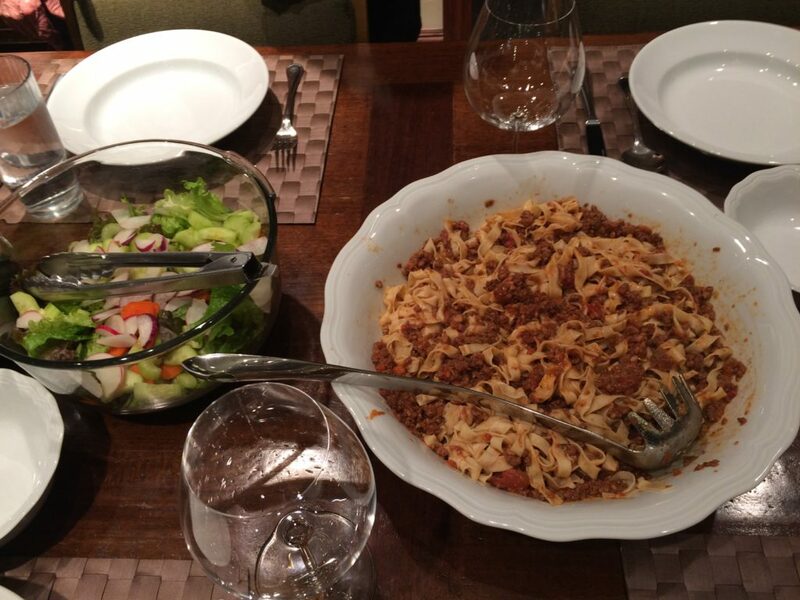 I have been craving authentic Italian fare…Pasta Bolognese in particular. One might think that with the myriad restaurants here in the United States that it would not be a difficult task to find a place serving the real deal…not so. I won’t mention any names, but one restaurant in downtown Dallas proclaiming to serve authentic Italian food brought me their version. It consisted of spaghetti topped with a red sauce which had ground beef added. This, my friends, is NOT authentic Pasta Bolognese. In the Italian town of Bologna, Pasta Bolognese is simply known as ‘ragù’…or “Tagliatelle al ragù” – with ragù referring to a meat sauce. Here in the United States we think of this sauce as being more tomato based with meat added [as it was presented to me in the restaurant in Dallas]. However, an authentic Bolognese ragù is mainly meat with a very small percentage of tomato added for flavoring – be it in fresh, puree, or sauce form. In fact, the original recipe had no tomato. Zero. Tomatoes were eventually added, though certainly not as a main ingredient. Never as a main ingredient. I cannot offer up THE ONE authentic recipe for Bolognese. Bolognese in Tuscany can vary from household to household, Nonna to Nonna, each proclaiming theirs to be the best and most authentic version. However, there are many common traits interwoven throughout each of those recipes. They typically begin with a sofritto. Sofritto is a diced mixture of onion, carrots and celery. Surprisingly, garlic is not often added to a Bolognese sauce. And neither are most other spices. 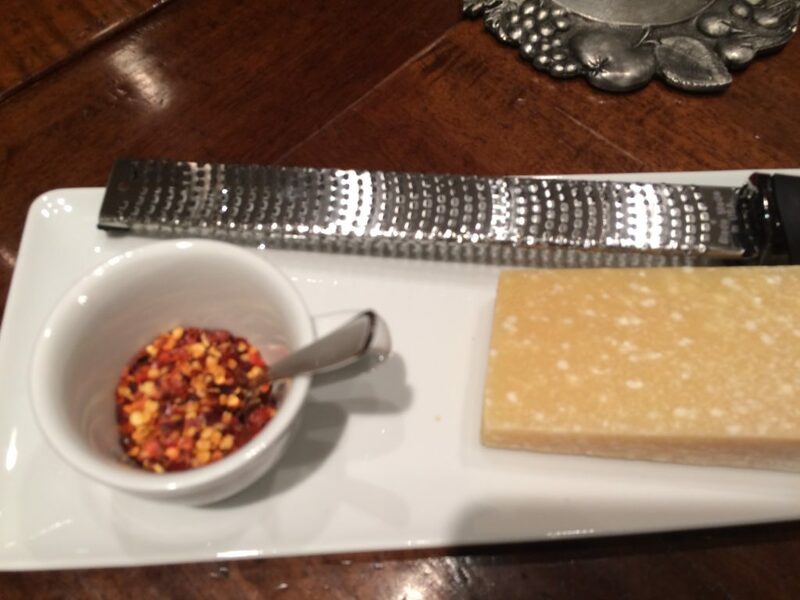 That would be a “no” to oregano, thyme, basil, even red pepper flakes…pretty much anything but salt and pepper. As I mentioned above, tomatoes are only added for flavor, they are not meant to be the base of the sauce. I use canned whole tomatoes in my version, San Marzano when I can get them. Wine may or may not be added…some recipes call for red, some white, some none at all. This is where I’d like to point out then when there’s an option to go with wine, go with wine! A mixture of ground meats is typical: veal, pork and beef are common. I can’t always find ground veal, but I definitely mix in some ground pork or sausage with my ground beef. And finally, whole milk – not cream – is added as the meat cooks to tenderize the meat and mellow the flavors. The first time I made this sauce I added the milk at the end of the cooking time, per the recipe I found. Upon further research I learned the meat is to be cooked in the milk. It tenderized it as it simmers. This is what I did the second time I made it…and I’ll admit, it was better. I have made it that way ever since. Here is a link to a recipe on Food Nouveau for Pasta Bolognese. After concluding my research, this one is one of the most authentic versions I have found. It does include garlic [not authentic] – but to be honest, so does the version I make. I love garlic in the ragù…heck, I love garlic, period. What can I say? 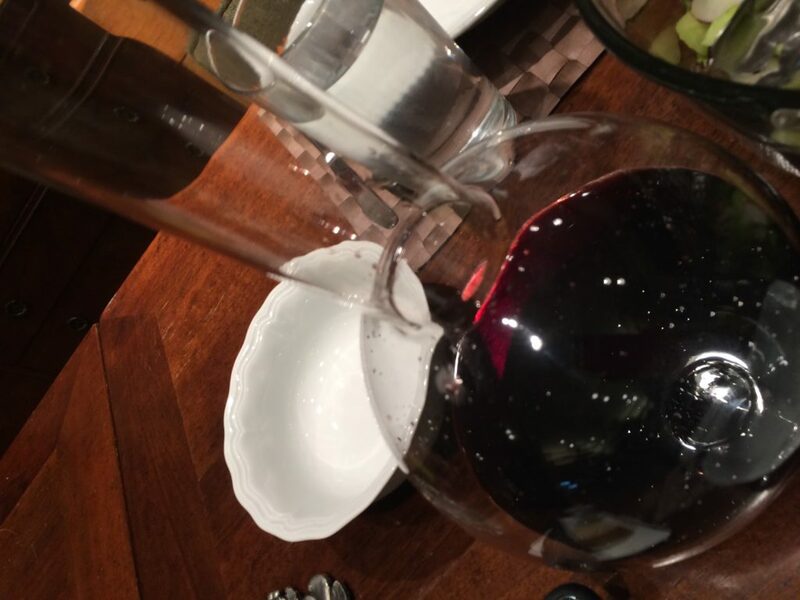 I use red wine in lieu of white…just a personal preference and what I normally drink and have on hand. In my research, I saw many recipes which used either one interchangeably. Lastly, I add pancetta or bacon in with the meat when it cooks. I like the depth of flavor it offers. And, well…bacon. Enough said! Fresh Pasta – a Huge Difference! I make my own pasta for this. I don’t always use homemade pasta when I cook Italian fare, but for this I am convinced it is an enhancement. The fresh pasta seems to soak up the flavor better than dried…and the wider noodles hold the sauce and allow for that perfect bite. I do not have a cutter for tagliatelle, so I often cut it by hand; if I am in a hurry I use the fettuccini attachment to my set. Flour makes all the difference here. I have tried all-purpose flour but the pasta comes out much drier and has a different texture. The best is the Italian ’00’ flour (this, I’m convinced, makes all the difference!). The only other ingredients are fresh eggs (from pastured hens is my preference), salt, and if needed, water. My pasta recipe comes from “The Silver Spoon” cookbook [click on Silver Spoon for the recipe I use] and goes together in minutes. With this special attachment to my Kitchen Aid mixer*, it rolls out in no time. I get it if you aren’t willing to make it by hand. I really do. It can be a bit much. But perhaps not as much as you may think. I sure hope you’ll try it at least once. For me, there was no turning back…and it gets easier and faster each time I make it. Essential [IMHO]: have a large chunk of Parmigiano Reggiano on hand to serve with this. And even though it is practically forbidden, I offer red pepper flakes on the side. Like garlic, it’s a personal preference I have. The meal would not be complete without a beautiful bottle of fine Italian red wine. I mean, really, if you are going to spend ALL DAY cooking such a divine meal, why serve it with box pasta and cheap wine? *Please note, I get no money from any of my links; just want to let you know what I use and prefer. If you have your own devices and methods which you prefer I say go for it! My links are solely for information purposes.